Justrite cabinets are extra strong, sturdy & secure. They are FM approved, high performance and designed to withstand fire for a minimum of 10 minutes. 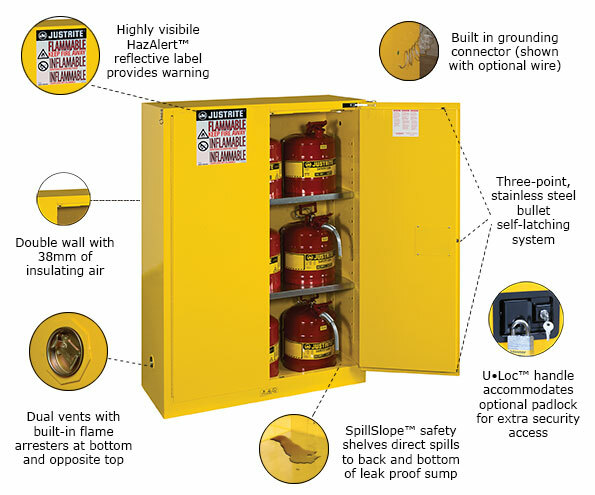 Justrite Cabinets meet OSHA & NFPA 30 – Exceeding COSHH Standards. Justrite cabinets have been constructed to limit the internal temperature to no more than 325 °F (162°C) when subjected to a 10-minute fire test. The cabinets will keep the flammable and combustible fluids stored inside from reaching spontaneous combustion for at least a minimum of 10 minutes – allowing time for employees to leave the premises and the sprinkler system to help put the fire out. Double cabinet walls are made from sturdy 18-gauge (1mm thick) welded steel with 1.5inches (38mm) of insulating airspace for fire resistance. The door astragal provides additional sturdiness & the formed internal offset adds rigidity and strength. Dual 2″ (51-mm) vents with flame arresters. These are effective in preventing the transmission of the flame. Reflective labels provide high visibility in the dark under fire conditions or power outage when illuminated by a flashlight beam. Warning in three languages. Large international warning icons enhance global communications. The 3-point stainless steel bullet self-latching system provides failsafe door closure with increased heat resistance. 2″ (51mm) liquid-tight containment sump to collect any leaks. Built-in grounding connector (optional grounding wire) to make sure the cabinet is safely grounded. Accommodates optional padlock for extra security and key coding multiples for convenient access. Double key set included for keyed lock. Doors will self-close and self-latch automatically in sequence to ensure tight closure from the top of the door to the bottom. This is ideal if an employee forgets to close the doors during a fire. The self-close mechanism is enclosed for obstruction-free access to the top shelf. *Coming to the range soon! Fusible links hold doors completely open to allow easy access. They will melt at 165°F (74ºC),then doors will self-close and self-latch to protect the contents of the cupboard from fire (on self-close models only – coming soon). Fully welded construction with no rivets provides greater protection in a fire as air gaps are reduced. Rounded corners reduce accidental nicks or cuts and potential hand injuries.